Bah. Not amused. I have a sore throat. I could grumble and moan for some time about how unhappy I am about this but I have to admit there is a slight bright side: I have an excuse to eat one of my very favourite foods. Crisps! I know that many people suffering from sore throats crave cooling, soothing ice-cream to ease their pain but I don’t. Scratchy foods make me feel better. Dry toast, crackers, cereal and, most of all, rough salty crisps. 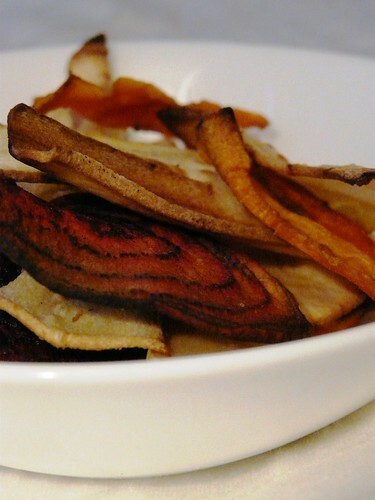 The following root vegetable crisps are a little healthier than the average potato chip for not only are they made from a colourful selection of different vegetables, they are also oven-baked. Pre-heat oven to 200 oC. Unless you are a sushi chef, you’ll need to use a mandoline to very finely slice the vegetables – length-ways for long vegggie, width-ways for rounded ones. Spray or brush the vegetables with the oil and lay out on baking sheets. Bake in the oven for 15-10 minutes until golden, turning halfway through. Remove from oven and spread out on a rack. Crisps will crisp up as they cool. Sprinkle with salt to serve. Well that certainly confirms that you are, in fact, my long lost sister! Oooh! Love the crisps this way (i.e., not deep-fried, and fairly thick-cut, and made from interesting things). Ryvita crackers always help with the need to scratch the throat – they’re way more scratchy than most! Surely you add some MSG? Organic MSG of course! Lucy – Ha! I knew it! DaviMac – I like those little Swedish dried biscuits… Can’t remember their name but wonderfully scratchy! Rosie – Dogs don’t eat crisps, Rosie. Don’t you know that??? I must say I’ve never heard of crisps as an antidote to sore throats! Personally I favour honey, and lots of it. Oh YUM! I love chips (or crisps, rather) when I have a sore throat. Much better than gargling with salt water. Here is my favorite concoction for when I am sick: In a coffee cup, add grated fresh ginger (at least an inch, peeled), a glob of honey, some dashes of cinnamon and ground cloves, and fresh citrus juice (I usually squeeze half a lemon). Add hot water and drink it all, even the bits of ginger. Feel better soon! Poor you. Bring on the crisps I say. I’m on two packs a day at the moment. Hope you feel better soon. Rosa – Honey’s good too but crisps are my cure-all! Salena – I am going to try that out tonight. Sounds wonderful! Chelsea – I’m with you. Tend to turn into a total glutton when I have a cold. Mallika – lol! We sound like we’re talking about cigarettes! Susan – Thank you. 🙂 I’m on the mend. My throat is sore and my head aches – can still make it to the computer though! Will try these veggies – they sound nice. Excuse my cullinary ignorance but what is a mandolin in the kitchen? I only know the one you play. Hi, I’m a sometime “lurker” on your site from the US. I googled parsley salad awhile back and it led me to you! Anyway, the crisps look wonderful. I will be converting to Fahrenheit and making soon! I do a roasted carrot, beets, Brussels sprouts and garlic with thyme that is beautiful– they look like little jewels. But for a sore throat, this is much better. My usual sore throat food is salty popcorn and fresh orange juice. Hilary – A mandoline is a vegetable slicer. It slices or dices or matchsticks easily and uniformly. It’s ammmaaaazing. Kirstin – Hello! Those vegetables sound wonderful. Love pretty food. I was looking for “how to bake beetroot crisps” and came to your blog as I need to eliminate wheat, sugar, diary, egg and white vegies from my diet. Now I’ve found beetroot crisps to take with me when having casual snacks with my friends. Although the beets were already in the oven once I found your blog. I mixed sprinkled sea salt flakes on the sliced beets then poured vegetable oil and tossed it well. Hope they aren’t disastrous because of adding the salt during cooking. Wow these are amazing. I really fancied some and saw they where 95p for a ting bag in my local shop so I decided to bake my own. SO WORTH IT. Thanks for the recipe. Definatly the best one on the internet. I used 2 be addicted to crisps but then my friend showed me this recipe like the one above and I have lost a stone. P.S. I also did more exercise. Can I please borrow this mandoline that you speak of? I’m wanting to make these for Wednesday night’s cinema trip. On that note you are welcome to join and I was given a LOT of beetroot today, do you want some? Rather than a weekly utdape, why not use the Praxis graphs; instead of having the x-axis as 24 hours, have it for the winter season, say Oct 1 to May 1 (we don’t usually have snow outside of those months). You could plot last year’s data as yesterday’s’ data, as well as add a third line for the 30 year average (might just be steps of monthly long term averages?). Then we could see this winter grow above (or below) the line and know exactly where we stand every 15 minutes! Oh the excitement.